The history of St. Isaac Cathedral dates back to the construction of the small wooden church commissioned by Peter the Great. The church was built in 1710 close to the Admiralty on the place where nowadays the Bronze Horseman stands. 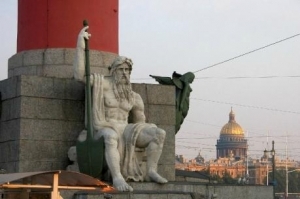 The temple was consecrated in the memory of Saint Isaac Dalmatian, the saint patron of Peter the Great. The Emperor loved this church. In St. Isaac's Church on the 19th of February, 1712 Peter the Great and Ekaterina Alexeevna, the future Empress Catherine the Great, got married. In 1723, Peter I signed the special order, according to which the sailors of the Baltic fleet had to swear allegiance only in St. Isaac's Church. After the death of Peter the Great some attempts to reconstruct the church and put up a cathedral, which would harmonize better with the gala architectural ensembles of the center of Saint Petersburg, were made but due to many reasons none of the constructions was completed and approved. For example, the temple of St. Isaac, founded in 1768 by architect Rinaldi, didn't serve for long. During a sermon a part of the plaster fell from the ceiling. After the detailed inspection of the temple it became clear that the building is in very poor condition and needs thorough repairs. In 1809, Alexander I declared the contest for the best project of the new cathedral. The most well-known architects took part in the contest, but the winner was a young French architect and talented drawer August Montferrand who had come to Russia two years earlier. Montferrand offered 24 projects of the future cathedral in different styles — in Byzantine, Romanesque, Gothic, and even in the manner of Indian and Chinese architecture. 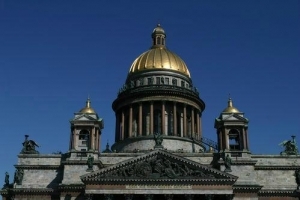 Alexander I approved the project of a five-domed cathedral in classic style. The construction works were started in 1818 and lasted for almost 40 years. People joked that Montferrand was foretold that he would die upon completing the construction of the cathedral that's why he didn't hurry. But in fact soon after the beginning of the works several serous mistakes were found in the designs of Montferrand who was a talented drawer but lacked architectural and design experience. The works were stopped and a special committee was formed that was to correct the project. 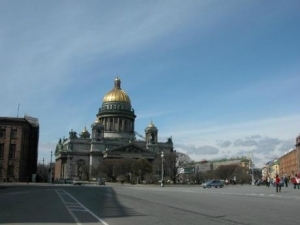 The solemn opening and the consecration of St. Isaac Cathedral that was announced the cathedral of Russian Orthodox Church took place on the 30th of may 1858. The temple became the city's main cathedral where the grand celebrations, impressive divine services and christenings of the members of the royal family were held. St. Isaac's Cathedral is the forth largest domed cathedral in the world, after the Cathedral of St. Peter in Rome, the Cathedral of St. Paul in London and the Cathedral of St. Maria in Florence. St. Isaac's Cathedral, which is 101.5 meters high and has the area of 4 thousand square meters, can hold up to 12 thousand people. The interior decor of the cathedral features an abundant use of paintings, mosaic works and sculptures made by well-known Russian artists and sculptors, such as Bryullov, Klodt, Pimenov and others. It is interesting to know that the ominous prophecy came true — a month after the construction of the cathedral was finished August Montferrand died. Under the Soviets St. Isaac cathedral housed the Museum of Atheism and the building got a status of an architectural monument. Mysteriously the cathedral suffered no damages during World War II. It took no direct hits during the numerous bombing of the city although still nowadays one can see the marks of splinters on the columns of the cathedral. Today St. Isaac's Cathedral is one of the best Russian cathedrals and one of the most popular museums in Saint Petersburg. The visitors are invited to climb the colonnade of the cathedral and enjoy the breathtaking view of the center of Saint Petersburg from the 43-meter height. In 1988, when Russia was celebrating millennium of Christianity, the cathedral for the first time after a long interval was used for prayer.